For almost a year, I've been publicly predicting Donald Trump will win the election. Now, with the deep state turning against Hillary -- and with damning evidence about to be leaked that will take her down forever -- a Trump victory is more certain than ever. All across America, the "deplorables" have taken America back from the corrupt political elite. CELEBRATE your victory, friends and fans. We have defeated evil incarnate. 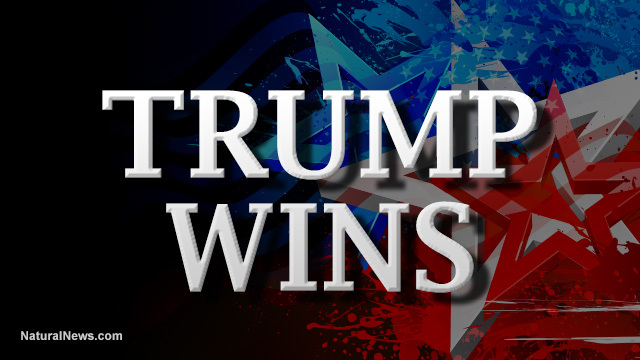 We have defeated hatred, bigotry and extreme deception of the mentally ill democrats. We have defeated deep corruption, CHEATING, lying, rigged polls, rigged news, rigged FBI decisions and more. We the People, just as I promised yesterday, are taking our country back. Today We the People are taking America back from the lawless, corrupt, incompetent criminals running Washington and the lying leftist media. We're going to start by rejecting Hillary Clinton and the entire corrupt political class, most of whom belong in prison, not in high office. Next, we're going to reverse the completely idiotic policies, executive orders and regulations of the lunatic leftists who have been running American into the ground for the last eight years. This effort is going to begin by completely repealing the disastrous, unconstitutional, ill-conceived health care fiasco known as "Obamacare." Even while that's happening, we're going to turn off the lying leftist media and stop watching their state-run propaganda parading around as news. All the "fake news" organizations -- Associated Presstitutes, Reuters, CNN, MSNBC and the Huffington Post -- are going to find themselves plummeting in audience size as informed people reject the deep media corruption that has been on raw display during the 2016 election. Today we have a prayer for America. We have a chance now to beat back the tyranny, corruption and collusion of Washington D.C. Spread the news far and wide: We have just defeated EVIL in Washington. Today, I'm announcing a red alert warning: The big crash is likely to begin soon after the election, no matter who wins... If Trump wins, the stocks take an instant dive, reflecting the fact that corrupt Wall Street banksters realize their money making scams are going to end under Trump. After some strong government intervention, they will recover and just barely hold together until Trump is inaugurated in January of 2017. After that, it's economic doomsday as the central banks deliberately crash the system to blame Trump and call for his impeachment. Who accomplished this victory against the establishment? YOU DID! And the alternative media, the truthers, the dedicated patriots and all the tens of millions of Americans who woke up and said enough is ENOUGH! Sleep well, my friends, for tomorrow the real battle for liberty begins. Next, we must urge Trump to indict and prosecute the Clinton criminals as soon as he takes office. We must also tell Donald Trump that we fully support his effort to #DrainTheSwamp in Washington.